It would have been great to blog about the process of getting our system installed, but now it’s been up for more than a year, so, too late for that. The array generates all our electricity. Read below for a summary, written last year. It was definitely a learning experience to see this through. I had way more companies come out to bid than I should have, but it seemed every one had different ideas. I really liked the discreet look of the Sunpower modules, and only a few companies had rights to install them. We ended up going with SolarWorks, Inc. from VT. I signed the contract in April ’07. Every local government has their own way of dealing with permits, etc, and Ossining Village basically outsources all liability, choosing to require the homeowner to have an engineer or architect draw up plans for practically anything. Once another professional puts their stamp on a project, Ossining OKs the project and issues the permit. Solarworks had to renew their local contractors license, so this added more time. Then they found an engineer who (in my opinion) required more than was really necessary to ensure the roof wouldn’t cave in or blow away. He said we had to either support every beam in the roof over eight feet with another beam, or build a wall around all four sides of the attic. This was going to be much more than I bargained for, and I was upset that Solarworks didn’t tell me I might have to reinforce my roof to such an extent. Of course, I think this was a surprise to them as well. Jumping to the end of the story, Solarworks came though with flying colors. They settled everything with the village and the engineer and dealt with any other headaches. The installation was completed in January ’08. The cost for the entire job was a little over 53,000.00. No we didn’t pay anything near that amount! 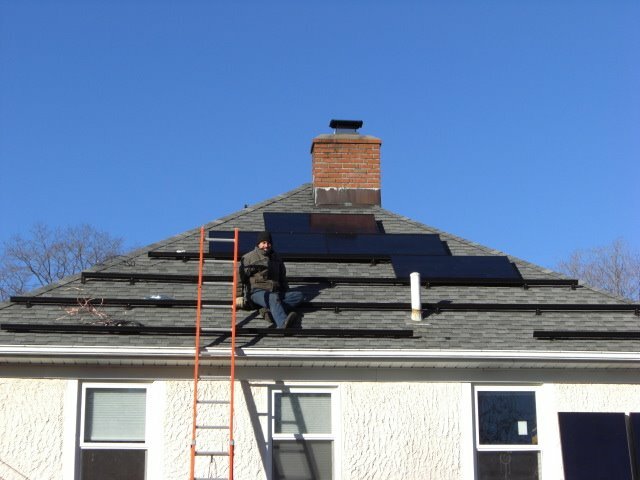 NY State has incentives in place which covered 23,000.00 right off the bat (http://www.powernaturally.org/Programs/Solar/incentives.asp). Next year we will get 5,000.00 lopped off our state taxes and 2,000.00 off Federal. True, the money is gone, but it went to Solarworks and not to taxes. AND, what we effectively did was to prepay our electric bill (at todays prices) for the next eleven years. NY State has another program, the Energy$mart Loan (http://www.getenergysmart.org/SingleFamilyHomes/ExistingBuilding/HomeOwner.aspx), which buys down the interest rate on loans that pay for renewable energy enhancements. We can get a 20,000.00 loan which will be a fixed payment for 10 years at 1.5 interest, and the payment will only be about what our current electricity bill is now. So the final out-of-pocket expense came down to only 3,000.00! Also, the minute we came online, our panels ended our dependence on conventional electricity (coal, nuclear) and the tremendous environmental costs associated with it. Win win all around! The easiest thing was to to replace our old incandescent bulbs with compact fluorescent ones (CFLs). The various companies that make them have really improved from the days when you felt like you were stuck in an old phone booth. I went ahead and made the investment to replace every bulb in the house. We had some trouble with the fixture on a dimmer switch in the dining room; it’s only recently there are CFLs available that can be dimmed. Check out some at http://www.Smarthome.com. The very next month our electric bill was down about $30.00. The next step was to do nothing to our lawn. All it takes is a mental adjustment! We like to say we have a “diverse lawn.” All manner of species make their home here. We’d much rather do our best to add organic fertilizer or compost to strengthen the lawn, than to go with chemicals. I take the train to work! I walk more than a mile to the train, a mile from the train to work, and the whole thing in reverse. I get about five miles a day of walking exercise, I save $$ ($71.00 for a monthly pass as opposed to $120.00 in gas alone) and I have time to think and appreciate the day. The previous owners of our house used a wood stove for a time as their only source of heat. When we talked about it, they told us how much effort it took to split the wood, keep the stove going and clean it out. They said the air was always dry and they had problems with soot, but it was so much cheaper than oil they stuck with it. Until they didn’t. When we came, the only remainder of their wood stove was a register vent on the ceiling and a bank of really ugly tiles along the wall. Well, it’s a new world. Our house has a new source of heat, a Harmon Pellet Stove. We installed their fireplace insert, and now I’m grateful for the register vent, because the heat from the stove disperses through the entire house (1800 sq ft). More on this later. Pellet stoves are actually high-tech furnaces, with built-in thermostats that can keep your living environment a consistent temperature. They turn themselves on and off, depending on the need. They use electricity, unlike a wood stove, and the air is dispersed through a blower fan rather than just emanating heat. Our stove uses about 100w. The fuel, in our case sawdust pellets, is created from the byproducts of the lumber industry, sawdust that would just be pure waste otherwise. A pellet factory can actually use pellets themselves as fuel to run the machinery that makes the pellets! Alchemy if I ever saw it. Pellets claim the lowest emission of any biomass fuel. Our stove creates no visible smoke; units can be vented out the side of a house ten feet from a neighbor and no one will ever complain. Given that the trees generated oxygen for their lifespan before becoming sawdust, it’s safe to say this fuel is “carbon neutral”. Added to this is the extreme efficiency of the stoves themselves. I only need to empty the ashpan about once a week, after it has burned up to 14 forty lb bags of fuel! Pellet fuel is also a non-volatile market, unlike oil. They’ve gone up in price about $1 in the last ten years, to somewhere between $5 and $6 a bag. A few years ago, there was a big pellet shortage, but that was because the industry was not ready for the unbelievable demand. No problem with that now. Speaking of 40lb bags, it’s time to admit a pellet stove isn’t for everyone. When I was extolling it’s virtues to my mother, she wished she could get one too. She lives in a drafty old 30 room house with four fireplaces. She’s 82. Sorry mom, not for you. It’s also not for anyone who wants to just not think about the heat in their house. *A pellet stove does need feeding. For me, it’s nothing; I get up, I feed the cat, I feed the dog, I feed the stove. *You need space in the basement; we get two tons delivered at a time, and one ton takes the space of a pallet four ft high. *Every three weeks of use, I let it go out completely, take the vacuum cleaner and clean it out, which takes about 20 minutes. Once I’ve done it enough I think I’ll get that down to ten. *There is definitely an audible white noise that is a new sound in the house, but because it is so consistent and gentle, we adapted after only a couple of nights. Our oil burner, by comparison, sounded like a jet taking off when it ramped up. During the coldest winter months, the stove wasn’t quite making it on the second floor, and we needed to keep the thermostat turned up. This annoyed me, so I did a little more research and found a “register booster” by Airstream. It’s a little heat sensing fan device that detects warmer air from one side, and redistributes it to the other side. Once that little thing was on the floor in our second floor hallway, we were golden. Now, all our thermostats stay completely turned down (except the upstairs zone when it’s really cold), and we are mostly free of oil. And we got rid of the ugly tiles, by the way. Back in the late 80s, we were living in Washington Heights, NY. We didn’t even own a car, so we certainly didn’t do any car shopping. Once we had our son, Julian, we used his baby carriage as a shopping cart and wrapped all the plastic bags around the handles. We lined our trash cans with the bags, but still had tons of leftovers. Sharon had remembered how people in Europe just naturally brought their own string bags. We looked for them in the U.S., but when they were nowhere to be found, Sharon realized this could be a great business; something we could believe in and served an obvious need. We coined the term ECO-BAGS (and now own the trademark) and began designing and manufacturing. Fast forward to today: Do we religiously use our ECO-BAGS® Brand bags? Answer: Almost always. We put a bunch of canvas bags into one bag and throw them in the car. That way, when we’re out and have a spontaneous shopping spree, they’re already there. When we come inside and unload, the bags all get put together again and hang on a hook. Next time we go out, we throw them back in the car. Using four or five canvas bags stuffed to the gills instead of thirty plastic ones is so much easier. However, the answer was “Almost always.” Sometimes we haven’t gotten the bags back in the car. I’ve been known to balance several items in my arms in order to avoid getting a bag, but there are always times when you just have to use one! This actually works out when we shop at the supermarket, because we bring our pile of plastic bags as well, and use them instead of using new plastic produce bags. We do sell produce bags, and some people swear by them. Now that we’ve added the TARE weight to them (so the clerk can adjust the scale) I don’t worry about paying more if the produce is expensive. Once home, I transfer our produce into recycled plastic bags, to keep the air from drying the veggies out. Someone once said you have to “Choose your level of virtue”. We try to make informed choices but avoid dogmatic zeal.